The vegetarian Red Carpet supplement contains essential fatty acids GLA and ALA (only found in nature and at HUM), Vitamin E and Black Currant Seed Oil - making it the perfect formula to support healthy hair and repair the effects of winter on dry skin for hydrated, glowing skin. 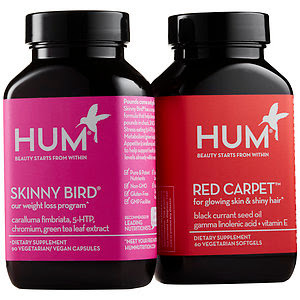 The perfect complement to Red Carpet, Skinny Bird contains HUM Nutrition’s unique ‘SMAC’ formula, which targets the key factors of weight gain to keep unwanted pounds in check. Skinny Bird’s combination of 5-HTP to reduce Stress eating, green tea extract to boost Metabolism, caralluma fimbriata to help curb Appetite and chromium to help Control blood sugar makes for an effective weight loss program that will help stave off holiday weight gain. In a 12-week clinical study participants lost over 2 inches in just 9 weeks. Red Hot Holidays is available exclusively at Sephora and Sephora.com.